I used an 11x15 cake pan. I cut the cake into 6 equal pieces. I made the blocks by making three 2-layer mini cakes. I used the Wilton bear cake pan and decorated him to look like Winnie. The blanket was made from fondant. Awesome article, you provide great information on this website, thank you for your work. i like the way you spoke about it, this post is very well written. This is a great little post with some valuable tips.I totally agree.The way you bring passion and engagement into the things you do can really change your outlook on live. This is very impressive thanks for sharing this post. This information is very helpful thanks for sharing such post i really appreciate it. It's awesome! Thanks for sharing your mind! such stuff is not easily found on other websites. I cut the cake into 6 equal pieces. I made the blocks by making three 2-layer mini cakes. I used the Wilton bear cake pan and decorated him to look like Winnie. The blanket was made from fondant. this information you shared because its really helpful for everyone. I used the Wilton bear cake pan and decorated him to look like Winnie. The blanket was made from fondant.
. 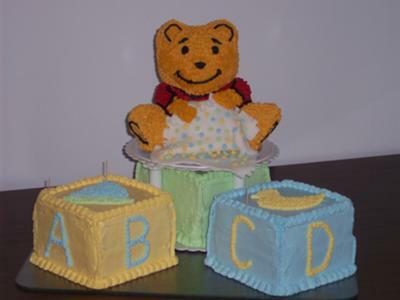 I used the Wilton bear cake pan and decorated him to look like Winnie. The blanket was made from fondant. Vezi seria Winnie the Pooh la magazin calculatoare second hand Timisoara in premiera la oferta sh. Perhaps you could write next articles referring to this article. I wish to read more things about it! I like this blog in which you have shared nice tips about baby showers. I have also bookmarked the website. interesting things or suggestions. Perhaps you could write next articles referring to this article. I wish to read more things about it! out Online Dissertation Help are superb. Please keep them coming. Greets!! I wish to suggest you few interesting things or suggestions. Perhaps you could write next articles referring to this article. I wish to read more things about it! It is perfect time to make some plans for the future and it's time to be happy. I've read this post and if I could I wish to suggest you few interesting things or suggestions. Perhaps you could write next articles referring to this article. I wish to read more things about it! I appreciate your efforts in preparing this post. I really like your blog. This is a great website,in which you have mentioned about baby activities which are good to read.I have bookmarked the website to read more. I like reading your post,you have written very nice post,which is very informative.I will share the post with my friends. The essay service reviews is the wonderful sites it was very good chance to develop skills to students, they are known to simply read and write for educational skills in their future thank you. I have seen your post,you write very well,i am impressed to see your work.Before writing a post you searched for the data which is good.I will share the post with my friends. I am pleased to visit this website,this is my first visit and i like reading the content which is useful and also unique,such stuff is not easily found on other websites.